In cold weather, your body may lose heat faster than you can produce it. The result is hypothermia, or abnormally low body temperature. It can make you sleepy, confused and clumsy. Because it happens gradually and affects your thinking, you may not realize you need help. That makes it especially dangerous. 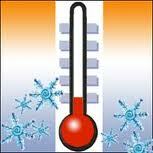 A body temperature below 95° F is a medical emergency and can lead to death if not treated promptly.